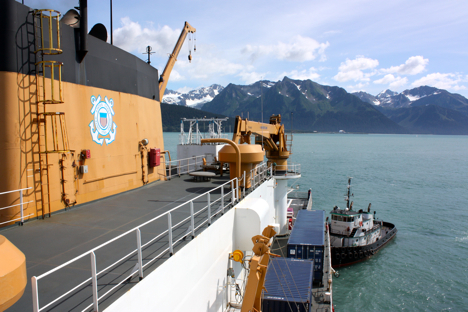 On July 29, 2011, The U.S. Coast Guard Cutter Healy docked in Seward, Alaska, marking the end to the field component of NASA’s ICESCAPE mission. The multidisciplinary group returns to their land-based labs to apply the data toward improving of space-based observations, and to finish piecing together the story of how sea ice and ocean systems impact Arctic ecology. Continue to follow the mission’s news at nasa.gov. 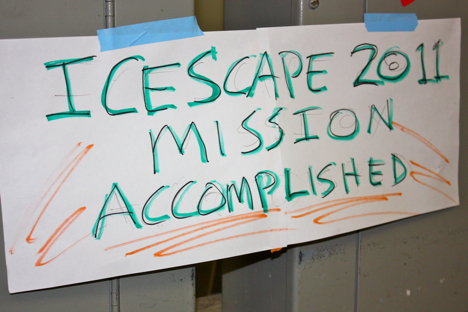 Before heading to the Anchorage airport, a few scientists on board shared some parting thoughts about the ICESCAPE mission. 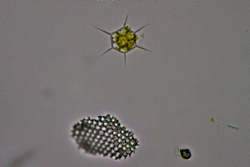 The most interesting thing I learned during ICESCAPE was the phytoplankton community could be represented by so many major algal groups, like diatoms, dinoflagellates, coccolithophorids, silicoflagellates and picoplankton. One thing I will never forget about ICESCAPE will be walking over the desolate ice in the Beaufort Sea (a truly surreal landscape) with almost 2 miles of water below me! One thing I will never forget about ICESCAPE was that people liked my version of “Hotel California” much more than I had expected; And they were nice enough to tell me they liked it! I finally got to sail on the Healy after ten years being away from oceanographic related work, which completes the trifecta of sailing on both polar class ships – Sea and Star and now the Healy. It was a wonderful experience and the beauty was I could share things with friends and family in a timely fashion, since email was readily available. Ten years ago, it was NOT!! One thing I will never forget about ICESCAPE is my experience taking a melt pond core and during the process having my boots flooded with ice cold water but I still enjoyed every moment of it! 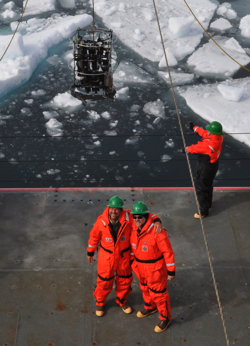 respected researchers but ultimately the success of the 2011 ICESCAPE mission was the result of the shared sense of duty between members of the science team and the ship’s crew. The scene in the video (above) might look like the surface of the moon, but the feature is actually the mottled underside of a melt pond on sea ice in the Arctic Ocean. 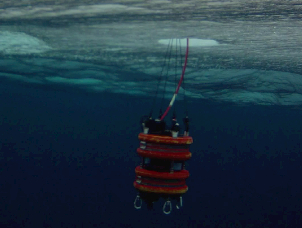 Here’s a look back at one of ICESCAPE’s numerous tools that scientists used to probe the depths of this rarely observed environment. Ice blocks some incoming light, but not all of it, and scientists want to know how much makes it through and is available for photosynthesis. 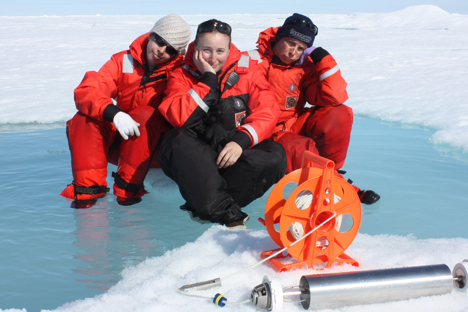 To find out, Karen Frey, of Clark University, managed the ICEPRO and ICEPOD duo at the mission’s nine ice stations. The instrument package provides profiles of optical properties below sea ice and melt ponds, a region hidden from view of satellites. The device has sensors that look up and down through the water column. The upward-looking sensor measures downwelling light, and the downward-looking sensor measures upwelling light. David Mayer, of Clark University, recorded the data with the click of a button on a laptop. 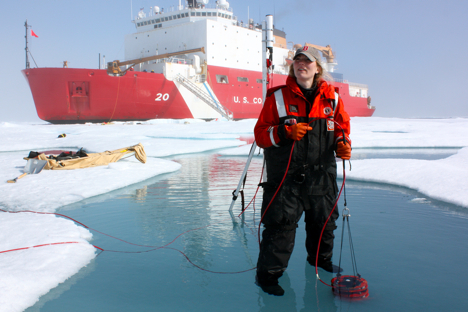 Meanwhile, a tripod or “ICEPOD” measures incoming light at the surface, so scientists can calculate the percent of total light transmitted through the ice. 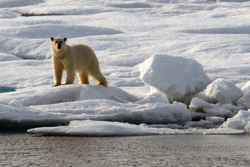 From the surface to about 10 meters deep, water below a melt pond will “see” much more light than water below bare ice. By about 20 meters down, however, contributions have all mixed together and water below a pond will about the same amount of light as water below bare ice. Mustang suits are hung, boxes packed, and pagers turned in. Tomorrow we arrive in Seward, Alaska, and step foot on land again for the first time in 34 days. Here’s a look at the ICESCAPE 2011 campaign by the numbers. 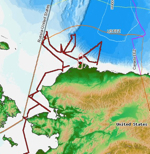 On July 25, 2011, the final water samples of the ICESCAPE mission awaited analysis in the lab on board the U.S. Coast Guard Cutter Healy. Small boat excursions: 15 (14 successful – one outing returned early due to leads in the ice closing in around the boat). Check out the full collection of photos from the ICESCAPE mission here. ICESCAPE scientists collected the mission’s final water samples today, and started the long steam back to Seward, Alaska. 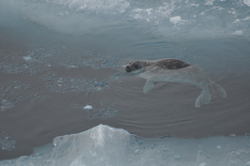 ICESCAPE chief scientist Kevin Arrigo, of Stanford University, explained the mission’s accomplishments as the campaign entered its homestretch. Can’t view the video on this blog? Watch it on YouTube here. Limited sources available at sea suggest that Aristotle and other philosophers dabbled in natural history by analyzing the diversity of the natural world. A modern definition emphasizes the observational rather than experimental approach to studying plants and animals. Even today with all of the fancy tools not available to Aristotle, there remains a benefit to simply observing, and the diversity we’ve seen is astounding. We have been wowed over sightings of charismatic megafauna — the polar bear, whales and seals that always draw a crowd to the ship’s bow. At an evening science talk on Thursday we oohed and ahhed over microscopic aquatic creatures that bridge the animal and plant worlds, and got a close up look at some of the ocean’s inhabitants producing some of the color we see from satellites in space. Here’s a quick armchair tour of Arctic natural history as viewed by ICESCAPE scientists with the longest lenses and sharpest microscopes. 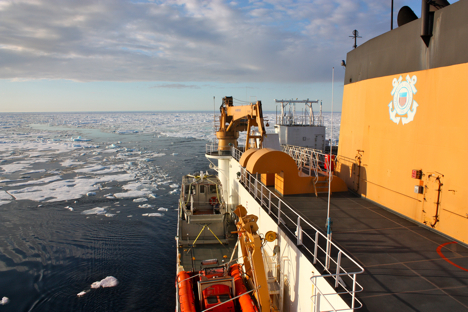 Sounds from the lab and from ice stations area as ephemeral as sea ice in summer. 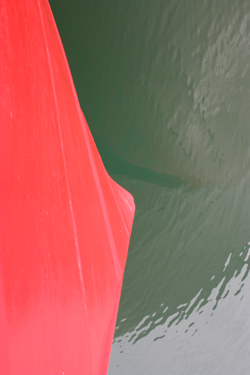 One sound, however, will not soon be forgotten by any ICESCAPE scientist on board the Healy: the ship’s alarms. 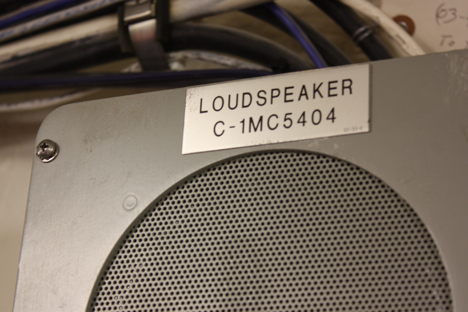 The sound (above) is a flood alarm that was broadcast earlier this week on the ship’s loudspeakers. Scientists reported to the science lounge as crew responded to the incident and found just a small leaky pipe. The Healy was built to be minimally crewed, and the numerous sensitive sensors on board help keep watch and keep us safe. 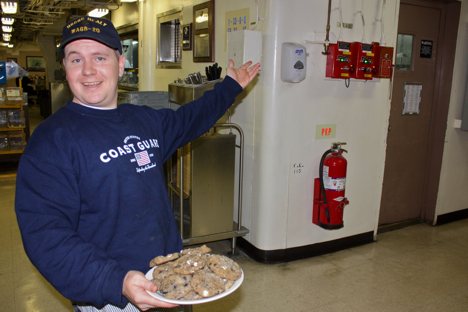 Possibly the most memorable broadcast is the daily noontime test of the ship’s alarms. From toxic gas and flight crash to ship’s whistle, the memorable sounds will echo in our minds long after we have left the Healy. The loudest broadcast, however, comes every Friday when the ship enters a training environment. 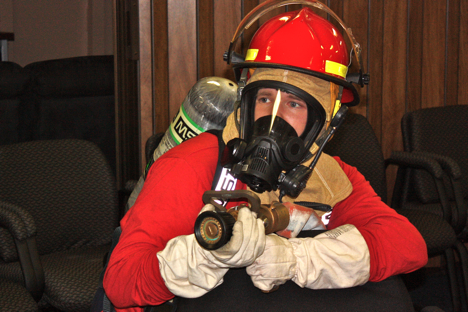 U.S. Coast Guard FS3 Zachary Young dressed down to respond to a report of “smoke” during training drills on July 22. 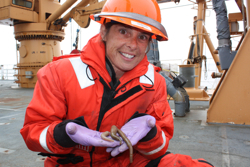 As Coast Guard crew practice their craft, scientists on board do their best to stay out of the way. 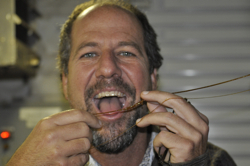 Greg Mitchell, of Scripps Institution of Oceanography, wants to understand how carbon dioxide is taken up by phytoplankton, the microscopic plants of the sea, to create biomass that feeds the entire ocean ecosystem. To do so, his work spans the scientific domains of optics and biology and also spans research platforms, from satellites to ships. During a coffee break from lab work, we chatted with Mitchell about his group’s research during the ICESCAPE mission. ICESCAPE: Why are you interested in algae? Mitchell: Algae are the microscopic plants that form the base of the oceanic ecosystem. They absorb light, that’s how they get their energy, so it’s important to know how light gets into the system and is used. My real interest is in photosynthesis and photosynthetic ecology of algae, but I’ve become an optics expert to do the photosynthesis work. In addition to the interdisciplinary science between the optics and biology, I’m also multiplatform scientist using ships and satellites as well as other instrumentation. The point is that there are different ways of probing the system. ICESCAPE: What tools are you using to probe the system? Mitchell: We have several different instruments but one that we’re collaborating on with Rick Reynolds [of Scripps Institution of Oceanography] is the Inherent Optical Properties package, the IOP. The inherent optical properties are the absorption and scattering properties of the water. Particles in the water can absorb and scatter light, and dissolved material can absorb light, which changes the optical properties of the water. So the IOP package measures a profile the different optical properties of absorption, scattering and size distribution of particles in the ocean. Ocean color satellites observe these changes in the optical properties of the water. If the ocean is green with a lot of backscatter or turbidity, then that’s an algae bloom. If the ocean has a lot of turbidity and not much absorption, then it’s a sediment plume. If the ocean is a deep azure — the color of natural water — then there is very low chlorophyll, sediments or other material in it. In addition we have a fast repetition rate fluorometer, which gives us information about the photosynthetic physiology, integrating my optics and photosynthesis work into one profiling package. We get continuous data down to 300 meters with the instruments so we can resolve the whole upper area where algae are living, they’re generally confined to the top 100, 150 meters in really blue oceans and maybe the top 10-50 meters in an ocean with more phytoplankton algae biomass because the algae themselves absorb the light. Things like salinity and temperature have been the mainstay of oceanography research forever, and we have long had systems that automate those measurements, but only in the last 10 or 15 years have we had these automated optical profiling systems. Fundamentally, multiple platforms and disciplines give us a different perspective on the system. I work across the disciplines between optics and biology and across the platforms and it creates synergy. ICESCAPE: How does the second year of ICESCAPE compare to year one? Mitchell: The science that I’m working on doesn’t change. Rick Reynolds and I are celebrating our collaboration of 15 years using the same frame with three of the same instruments we had on there 15 years ago. 15 years ago we were able to get this new generation of technology out to sea and we’ve been using it ever since across the global oceans. We take this all over the world, so we’ve been to the Antarctic with it, to the California Current, to the Indian Ocean, to the Western Pacific Ocean, the Atlantic, and now the Arctic, so really we’re on a mission over 15 or 20 years to get this automated optical system around the entire world to characterize the different ecosystems. It’s not like any one ecosystem we study is suddenly transformative. So what’s changed since last year? The observational measurements have not changed, but we’ve now acquired sufficient data over the last two years to better understand this complex Arctic ecosystem. The ocean ecosystem depends on primary production of phytoplankton, just like the terrestrial ecosystem depends on the primary production of grasses, grains and other things that grow. 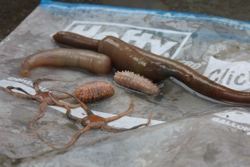 It’s the same in the ocean — the algae support all of the marine biomass. The Arctic Ocean has a very large amount of freshwater flowing into it for the size of the ocean basin, there’s a lot of terrestrial input and that terrestrial input brings sediments and also brings a lot of dissolved organic matters, things like organic soils that leach out, colored material. What happens is ocean color satellites tend to overestimate chlorophyll if a lot of that material is present. Our job is to understand the distribution of all the different components in the water, where are the concentrations high or low, and how are they changing in relation to each other. We measure that in detail not only with the IOP package but also with water samples that we do, and with detailed analysis in the laboratory. ICESCAPE: How is the Arctic environment different that other regions you have studied? Mitchell: In the Arctic there are strong gradients so we’re interested to get in the very deep basin where its blue water and low nutrients and low algae and low dissolved organic matter, and onto the shelf where there are high river inputs and high sediment inputs. We want to characterize all of those places in detail so that we can then create models that we can apply to the satellite data and get better estimates from the satellites. There is a lot of information about the optical properties of really clear water all over the world. What’s really important for this region is that we get the optical properties in the regions where these terrestrial sources are coming in so we can better characterize those and see how they mix in the basin. In addition to terrestrial sources, the complexity of the ice-covered region is fascinating as well. My interest is the whole ecosystem and what controls the rate of photosynthesis and carbon dioxide uptake. ICESCAPE: What has been the biggest challenge during ICESCAPE? 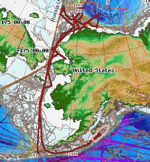 Mitchell: One problem is when we get into really blue water like we had deep into the Beaufort Sea and into the ice, the region doesn’t have many nutrients and the amount of algae and particles in the water is very low. 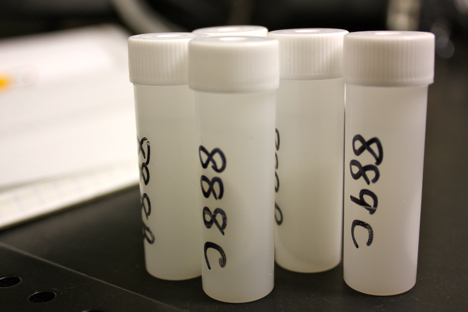 We divide all the water up but there may not be enough water for all the analyses that we want to do. 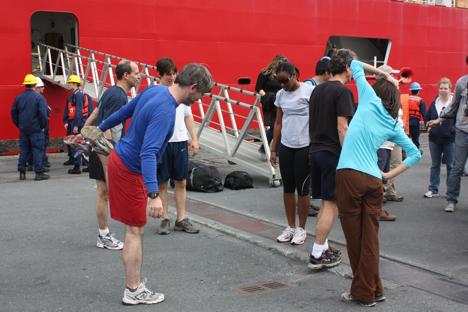 It’s a tough process of compromise between science logistics and all the different groups on board that need the water. People are tired, they’ve been working hard, and they want their water. It’s an interesting dynamic that happens on many cruises. On other cruises I have seen it referred to as water war. 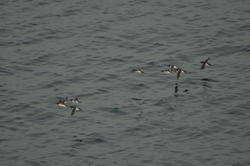 It doesn’t reach that point on this cruise because I think largely the groups are very sympathetic and compatible and the chief scientist Kevin manages the process very well. And then there is the balance between the different disciplines – ecology and ice and satellite validation — and how we allocate the precious ship resources. When you have the big interdisciplinary teams it tends to be a little trickier. But that’s also exciting, I like doing that kind of interdisciplinary work. There is no perfect mix, it’s a compromise and we have to all sit down and sort it out and that’s what we do. ICESCAPE: What have been the highlights of this campaign for you and your group? Mitchell: I like doing things that are different and new experiences. The highlight of my day in and day out work for my project scientifically has been that my equipment has mostly worked. Last year we had several instruments on the fritz that we kept having to fix. This year, knock on wood, my instruments have been working, which takes a lot of stress off of me. On the social side on the cruise itself, it has been fun to have about five people on board who are good musicians. I’m the hack on harmonica but they tolerate me and I’ve organized a group and we’re doing a little concert the day after science. In Dutch Harbor the night before we left, they had open mic. Elliot who works for my group is a really good guitarist and we went down for open mic and worked with Vinny, the guy who was organizing open mic at the Grand Aleutian hotel bar in Dutch Harbor and rocked the house. 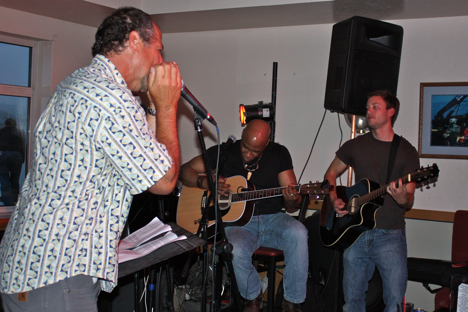 I don’t spend a ton of time with good musicians that will tolerate my harmonica playing and let me go, so when I get the right people it’s a special thing. ICESCAPE: We’re approaching the final week of the cruise, are you ready to get back to shore? Mitchell: Last year, after working 15-hour days seven days a week for 35-40 days, we were all ready to get a break. 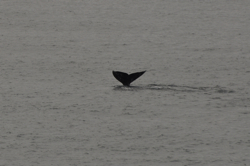 As we left the ice and headed south, I was excited anticipating the end of the cruise. But once we were out of the ice, I looked around and felt melancholy to be leaving the beautiful ice-covered Arctic. So yesterday rather than letting myself become sad, I specifically went and took a long hike around the ship to look at the ever-changing ice patterns and to take pictures to help me remember the amazing beauty. Mitchell: July 23 is the last science day, so we have three more days of data collection. After the last water comes on board we have about 30 more hours of sample analysis. Then we’ll finish our science work and begin packing up as we steam to Seward. It’s always a big shift of gears to finish the science and get into the logistics packing and sorting. I’m in charge of radio isotopes for all projects, so I have to clean the radioisotope isolation vans, double check all the waste reports and documentation, make sure there are no hot spots in the van, and get things all buttoned down for shipment. After that, I’m going fishing! We couldn’t have asked for better weather on July 19 for the ninth and final ice station of the 2011 ICESCAPE campaign. Inside the thick, orange mustang suits it felt as balmy as a day at the beach as teams expertly collected the last data set from the sea ice. “We finally hit our stride,” said Don Perovich of Cold Regions Research and Engineering Laboratory, who leads the on-ice efforts. With a few final reflections on the weeks of work and the spectacular sights, we boarded the Healy one last time and steamed south beyond the ice edge. 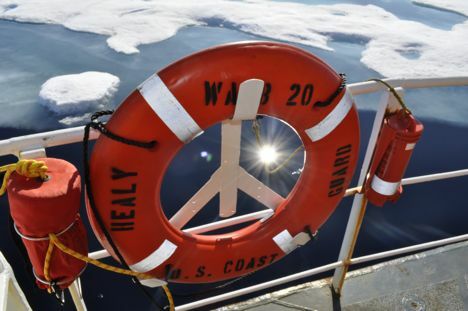 The Healy cruised south through thin broken sea ice and ultimately into the open ocean by midday on July 20. Today, with just a few more days of ocean sampling remaining, we entered shallow shelf water just 25 meters deep to see the influence of discharge from the Coleville River. 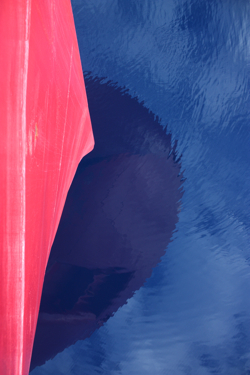 On July 20, the Healy exited deep ocean water (left) that appears dark blue. On July 21 we entered shallow water on the shelf, which takes on a greener appearance (right) due to the influence of everything from chlorophyll and colored dissolved organic matter to sediments. Satellites also see ocean color, and ICSCAPE is helping scientists parse out the relative constituents. Tonight the Healy heads back west toward the Chukchi Sea to check out what’s happening in Barrow Canyon.